I was extra motivated this weekend to get this terrain finished once I decided how I wanted to construct it. In truth, I still want to make a well, but that will be easy and add little to the look of the overall game board, so I thought I would just go ahead and share pictures of it. 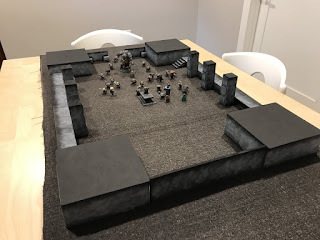 I found a picture for a board layout of Balin's tomb online for the Heroquest game. I like their boards because they are so symmetrical and pleasing to the eye. So I decided to use it as the basis for my own game board for my Balin's tomb scenario using the Lord of the Rings Strategy Battle Game rules. The scenario in the book calls for a 4' x 4' board, but that's just too big for Balin's tomb. 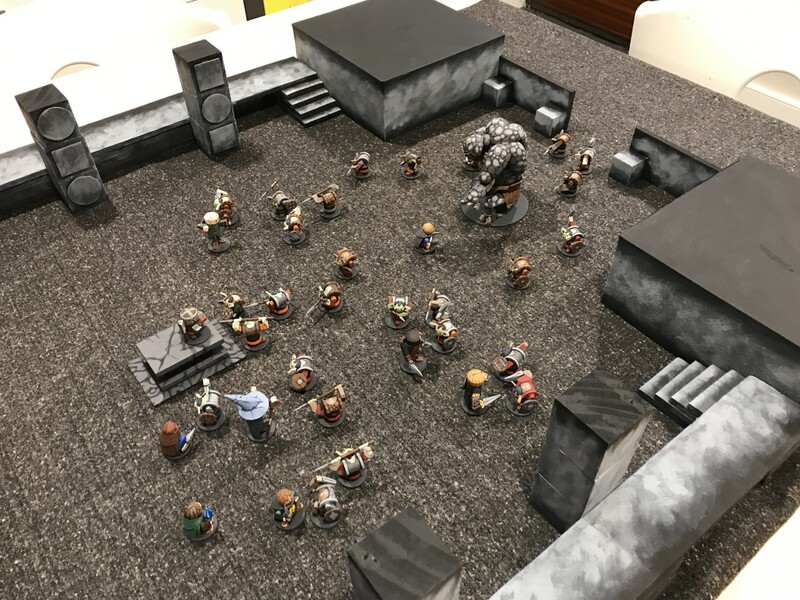 Also, I want to give the goblin players a chance to actually win this scenario, and the only way that is going to happen is if they can swarm the Fellowship relatively quickly, so a large game board is the goblin player's enemy. 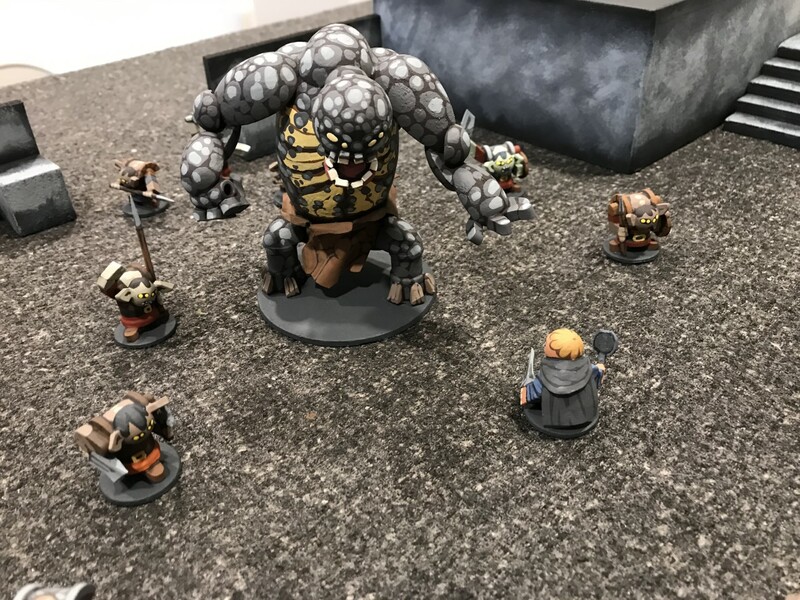 So I went with a game board that is in between the 4' x 4' monster called for in the book, and the tiny 15" x 18" or so board that some scenarios call for (that's actually too small for the number of figures, goblins specifically, that I want in the game). 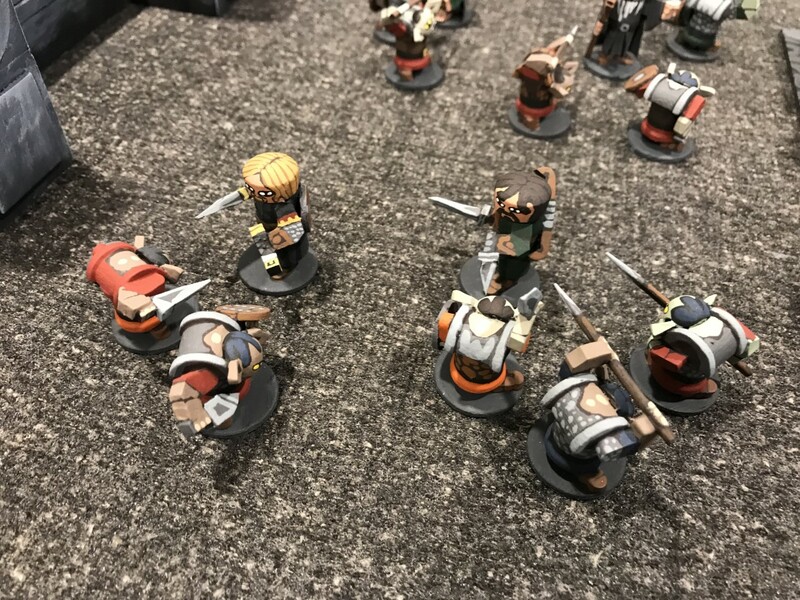 Of course I wanted to stage the pics of the board with the miniatures so that you can really see how it will look when I run the actual game. So that's what I did, choosing to represent a moment early in the scene in the movie where Sam comes face to face with the cave troll. There is the entirety of the board. It measures about 26" wide and 40" deep. More of a close up shot of the action and some of the scenery. 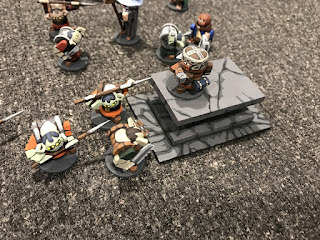 Balin's tomb I've talked about before, but putting Gimili on top of it with goblins rushing him just looks cool. Each corner of the board is a craft box made out of cardboard I got from Michael's on sale for I think $1.49 each. I just removed the lid, painted them black, and then painted the gray all around on the walls, leaving the tops black. 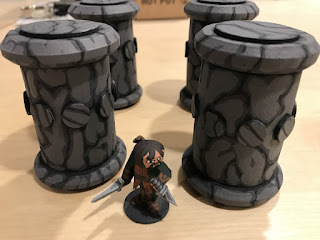 The pillars of course are different than the ones I did before. I decided to go with square ones, and these are just wooden blocks glued on top of each other (I believe they are 1.5" cubes) with precut thin wood circles and squares glued to the front side to create visual interest. The walls (on the front and rear of the tomb) are made from thick craft foam with wooden squares glued to one side flush with the bottom so that the wall will stand up and not tip over easily. I decided not to do an actual door and just leave the "doorway" open so that the miniatures can easily move through the space. I might change my mind and do an open doorway, we'll see. The two sides are made entirely from thick craft foam. The walkway is 2 inches wide, 24 inches long. The stairs are just the same thick foam cut of the appropriate length to make a stair step on each side of four stairs each. In the middle I stacked and glued four pieces of the thick foam to support the middle of the walkway to keep it from sagging in the middle. I decided not to put a "back wall" up against the back part of the walkway on each side of the room even though one is there in reality. I think that by not putting in a wall, it will make it easier for players to move the figures for the game without banging into a large structure with their hands, like the walkway, and causing problems during play. I hope that using the paint shade going from light gray on the front edge of the walkway to complete black for the part of the walkway that is against the wall will at least give the visual illusion that the walkway ends there in a "wall." 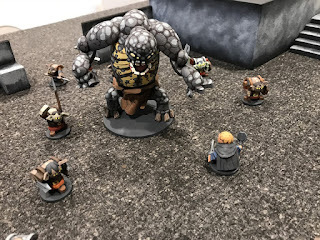 Sam bravely confronts the cave troll! 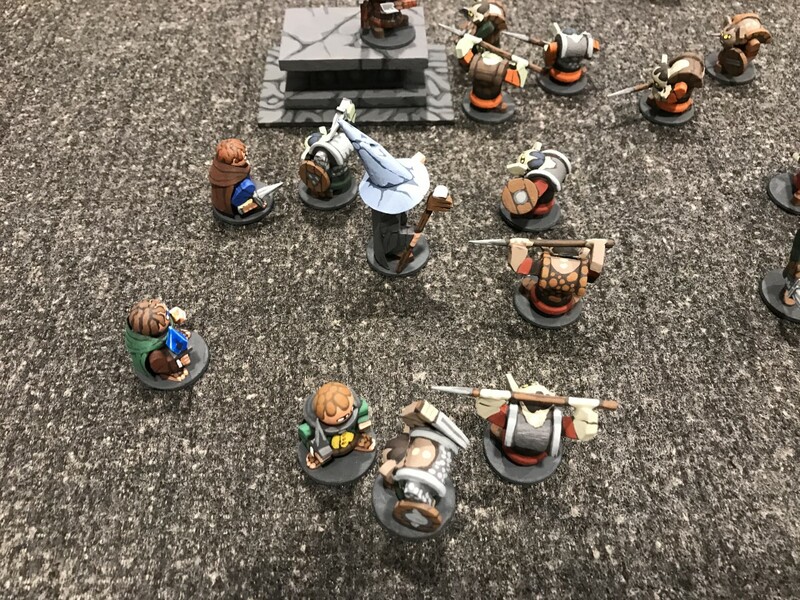 Boromir and Aragorn fend off a horde of goblins! 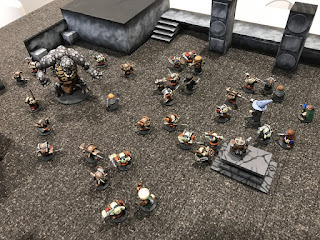 "Let them come! 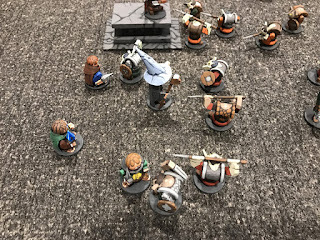 There is yet one dwarf in Moria who still draws breath!" Gandalf and the "wee ones" defend themselves! Another wide shot of the action, this time from the other side. I think the club game schedule is pretty full, so it will probably be June before I can run this game for the members, but I'm looking forward to it. I'll offer it at Barrage in September/October (whenever the convention falls this year) as well. In all cases when I run it, I'll post a battle report here with pics (assuming I remember to take them in the heat of the game!). I've been away from Craftees for a while now, instead repainting a boat load of Mage Knight figures for my biweekly D&D game. But this week I returned to doing Craftees at least for a little while to get the terrain done for the Balin's Tomb game I hope to run in my club probably in June. 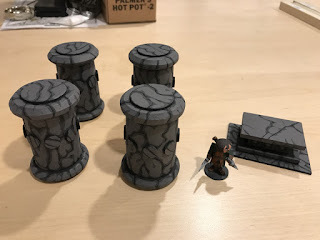 I'm still working on how to do the walls Craftee style, but here are some pictures of Balin's actual tomb, as well as four very large pillars that I will probably use (depends on how I decide to do the walls). If the walls are more than just a flat surface, then I probably won't need the pillars. But if they are just a flat surface, I'll need something in the room to provide cover, block line of sight, etc. to make the game interesting. Here are the four pillars and Balin's tomb with the Aragorn figure included for scale. You can really see how large the pillars really are scale wise. Here is Aragorn with the pillars more up close. And here is Aragorn next to Balin's tomb. Pillar construction was simple. Just a very large spool from a craft store with the larger circular thin wooden disc glued to the top (it comes in a pack with small, medium, and large discs all together), with the small discs from the same pack glued around the middle of the pillar to provide some visual interest. 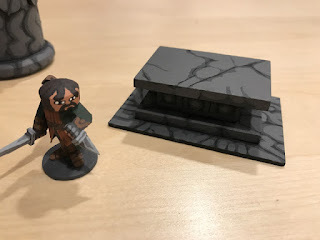 Balin's tomb is a thin 2" x 3" wooden base with the top and bottom "slabs" of the tomb made from 1 1/2" x 2 1/4" thicker pieces of wood that come together in a pack of I believe three or four at Michael's. The pieces in between the two slabs are six small cubes (1/2" I believe) arranged 2 x 3. Painting was the same for each. Base coat of black. Then I used dark gray to lay out the basic "marbling" appearance. Then on top of the gray a slightly lighter shade leaving some of the darker gray showing throw. That's about it. Next up will be the walls of the tomb itself, hopefully with a door like in the movie. We'll see what I'm able to put together.